The surprise royal order gave no explanation for King Hamad bin Isa Al Khalifa’s decision, other than to say that he had the final authority in such cases. “The study and evaluation of the situation of convicts should be based on criteria pertaining to the seriousness, impact and consequences of the crimes, as well as on the danger the convict may pose on national security,” the state-run Bahrain News Agency said in announcing the king’s decision. Authorities later will announce the names of those having their citizenship restored. Follow Jon Gambrell on Twitter at http://www.twitter.com/jongambrellap. On 5 May 2016 I reported on the Havel Prize winners [https://thoolen.wordpress.com/2016/05/05/2016-havel-prize-of-the-human-rights-foundation-goes-to-atena-farghadani-petr-pavlensky-and-umida-akhmedova/], including the ‘protest artist’ Pyotr Pavlensky. Now that he has been stripped of this award two months later, this should also be reported. The choice may have seemed a bit shaky from the beginning, but the more important is to recognize the decisive action by the award giver, the Human Rights Foundation. 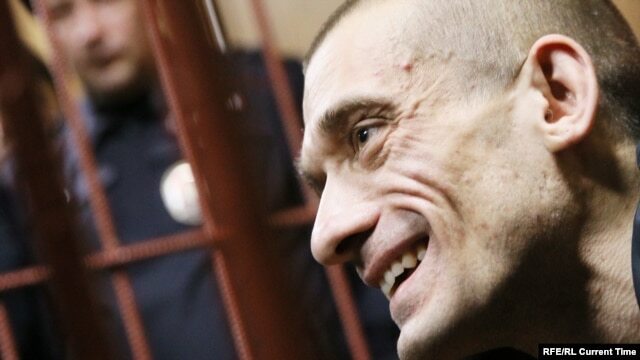 Pavlensky told RFE/RL on July 8 that HRF President Thor Halvorssen had informed him of the formal decision to revoke his prize in an e-mailed letter. The letter, which has been seen by RFE/RL, states that HRF regrets the decision as “unfortunate and unprecedented” but says the prize’s selection criteria disqualify those who have “advocated the use of violence as a valid method to fight government oppression.” Speaking to RFE/RL on July 8, Halvorssen confirmed that the organization had revoked Pavlensky’s prize but said HRF had nothing to add beyond the text of the letter sent to the artist. Dissident artist Pyotr Pavlensky talked to RFE/RL [Tom Balmforth] about what prompted him to take up political art, and how he sees his political stunts as a rejection of a pervasive “clerical” ideology. He does not take the cancellation lightly and accused the organizers of the Vaclav Havel International Prize for Creative Dissent of essentially “acknowledging their support for police terror” by withdrawing the award after he pledged to devote the $42,000 in prize money to the legal defense of convicted police killers in Russia’s Far East.